Recall that a transversal is a line that intersects 2 other lines at 2 distinct points. In the applet below, the dashed brown line is a transversal that intersects 2 parallel lines. 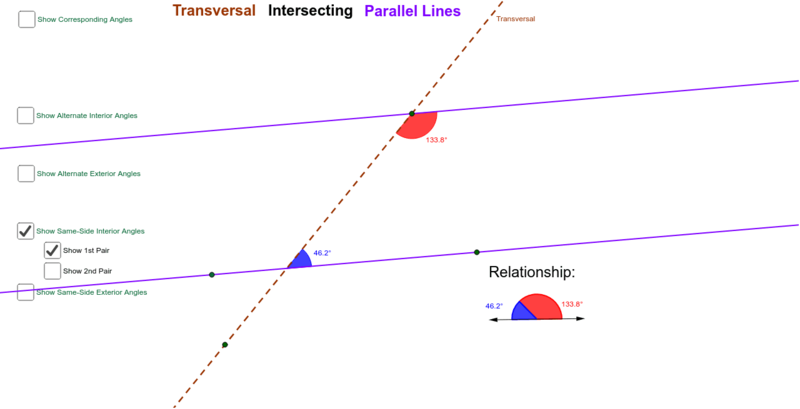 Take a few minutes to explore the special relationships among the various types of angle pair formed when a transversal intersects PARALLEL LINES. As you do, be sure to drag the green points around to change the red and/or blue angle measures that appear. Use your observations to correctly fill in each blank below: When a transversal intersects PARALLEL LINES, all pairs of corresponding angles are________________________. When a transversal intersects PARALLEL LINES, all pairs of alternate interior angles are ______________________. When a transversal intersects PARALLEL LINES, all pairs of alternate exterior angles are ______________________. When a transversal intersects PARALLEL LINES, all pairs of same-side interior angles are ______________________. When a transversal intersects PARALLEL LINES, all pairs of same-side exterior angles are ______________________.